Louisiana has the highest incarceration rate in the United States followed by Oklahoma and Mississippi while Maine has the lowest rate. 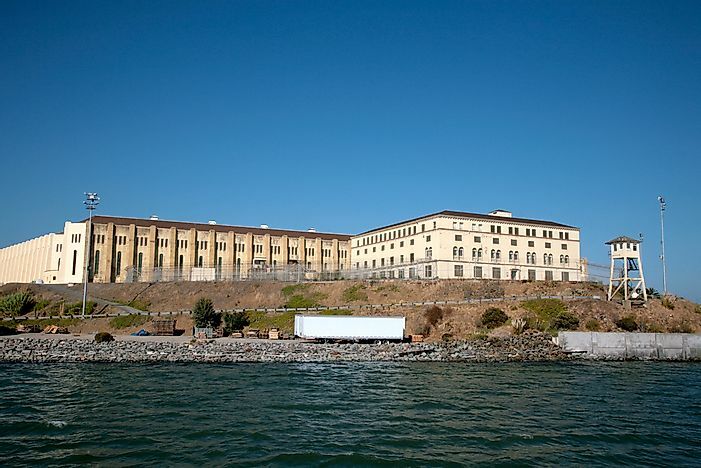 San Quentin State Prison is California's oldest detention facility. The United States of America is by far the country with the most incarcerated prisoners of the world with a whopping 716 prisoners per 100,000 person population, this number started growing and growing since 2008. In other countries this rate drops to less than 300 people in prison for a population of 100.000. Although the United States of America represent a rough 5% of the world’s population it represents almost a 25% of the world´s incarcerated population of 9.800.000 prisoners and is the top of the list mainly because the American justice system keeps their inmates for longer periods of time in prison. That leaves an incredible 2.300.000 prisoners approximately of a population of 311 million people in local jails, state prisons and federal prison meaning that more than one American out of hundred is being held by the justice system. This has not only overcrowded prisons but also taken a toll on the costs of a penal system that keeps growing and getting bigger for the government to maintain even though it has been proved to not be the most efficient way to ensure safety to the rest of the population. In the different states of America the rates differ broadly with Louisiana surpassing the rest and contrarily Maine staying in the bottom. In California there was a drop in the percentage of incarcerations per year for the first time in thirty eight years. Why is this? California's massive overhaul of its penal system to transfer responsibility for low-level criminal offenders to counties created a shift away from locking up people in prison or jail. There are many reasons for this to happen like type of offence, their duration, their rate of occurrence and the amount of space in county jails. For example there is a famous American law called the three strikes law which make it mandatory for courts to impose a 25 year sentence of imprisonment when an offender of a serious criminal offense does so routinely. Another reason is the war on drugs, which has not just change from a 5 digit number to a 6 digit number of more than 550,000 offenders that keep increasing per year in federal prisons. A study shows that more than 1 in 10 Americans have been charged for a drug related offense, meaning more than 30 million Americans have become “drug offenders” from users of crack to possession of cocaine with an obligatory 5 year sentence in both cases with no care on the big disproportionality between both of the offenses and the communities in which it is normally seen. This also affects young people in their 20s and 30s more than the rest of the population. The rate of women has increased double what the men population has increased for incarcerations per year making them 7% of the active prisoners in state and federal prisons. Nonviolent acts also increased with the support of various presidents making the number grow incrementally each year. Also women and men of different races like African American and Latinos suffer of harsh disproportionate convictions versus those of different races (800% vs 400%) under offenses such as conspiracy, accomplice, possession and liability of criminality. We can conclude that in evidence of the previously stated the United States of America penal system should have more limited and specific use of jails and correctional facilities to make this number smaller and that way use tax money for things that will ensure the safety of the public and the actual correction of offenders.